The best marketing and sales plans are the result of a process that addresses the business interests, revenue requirements and marketing goals of a company. 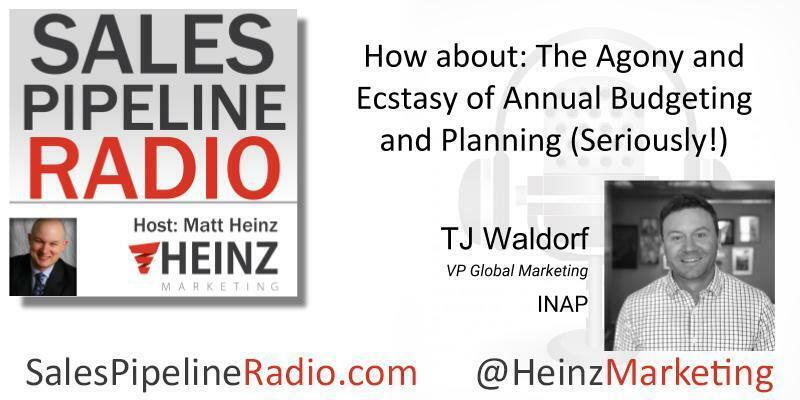 In this interview with TJ Waldorf, VP of Global Marketing for INAP, host Matt Heinz asks how INAP addresses the needs of the stakeholders to create a budget and plan. In the first part of the interview we discuss the planning process, in the second half we explore how the budget is created. TJ Waldorf leads INAP’s global marketing organization as Vice President of Global Marketing. Prior to this position, he served as Vice President of Inside Sales and Marketing at SingleHop, which was acquired by INAP. His previous experience encompasses a broad spectrum of marketing, sales, operations and business management positions, including management roles at Phoenix NAP and Secured Servers. There, he led initiatives to increase global market share across several data centers with a broad IaaS portfolio of dedicated and virtual servers, colocation, private and hybrid cloud. At INAP, we make performance-driven IT transformations a reality every day. The performance of your IT strategy depends on the performance of your infrastructure—its speed, resiliency and scalability. But as increasingly complex data center and multicloud solutions transform the ways we power applications and connect them to people, achieving the performance vital to the purpose of your organization is no longer straightforward. From data center location and compute environments to network security and interconnection, myriad factors dictate the performance of critical workloads and systems.